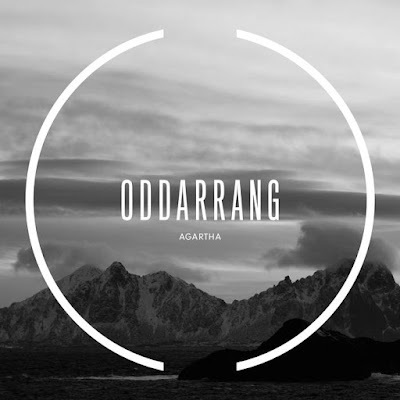 Agartha by Oddarrang is the same vein as the melancholy and bleak landscape of Sigur Rós and the ethereal moods of Mogwai. It’s the fourth studio album by the Finnish quintet and their second on Edition Records. It takes its title from the legendary world that is said to reside in the earth’s core, a land also recognised by Buddhists. The band is led by drummer and pianist Olavi Louhivuori (who also plays with Tomasz Stańko and Alexi Tuomarila) and Agartha follows Oddarrang’s previous album of compositions written for independent films, In Cinema. Oddarrang’s sound is arresting and absolutely its own, the result of the unconventional instrumentation of drums, trombone, guitars, bass and cello fused with great intelligence and the understanding of ten years’ playing together. On this album nearly everyone uses synths and all add their voices. The instruments and voices create a vast dense canvas and a recording so beautifully mixed and mastered it is possible to hear the tiniest of sounds, suggestive of the whirr of crickets or the breaking of ice, above the intensity. This is music perhaps best experienced at high volume in a cavernous space, as witnessed at their Jazzahead 2016 showcase. It’s chilling, dramatic, pulse-quickening and immerses you in a very dark place. It’s very hard to fit this music into a category – but that is its attraction and its originality, it’s not post- rock, it’s not “background music”. It’s arresting and visual, with beautiful emotional melodies and moments of serenity. Layers of fizzing synths and driving guitar lines meld with the despondent trombone and the calming eastern -sounding erhu fiddle. Add some eerie electronic bleeps and shimmering effects and yes, you can imagine the Northern Lights in this music. It is very tightly put together without cliché, there is a majesty and spirituality about it from the soaring opening of Aletheia , to the eastern orthodox drones in Central Sun, to the final triumphant cathartic release in the final track Telos/Agartha. Oddarrang is a very exciting band to see live, and listening to this album provides the next best thing. For those who know their Sigur Ros and would like it a tad less moribund and more ethereal? Check these peeps out.